Union Ministry of Health and Family Welfare has introduced the National Deworming Initiative on the occasion of the 5th edition of National Deworming Day-2018. The Union Minister of Health and Family Welfare, J P Nadda launched the National Deworming Initiative on 10th February 2018, at an event in Gurugram, Haryana. The National Deworming Initiative is aimed to reach more than 32.2 crore children aged between 1 to 19 years at schools and Anganwadi’s with the Deworming treatment in order to fight against parasitic worm infections. JP Nadda on this occasion requested stakeholders and all national health functionaries & health leaders to come together and participate to make this initiative a success with an aim of a worm-free India. 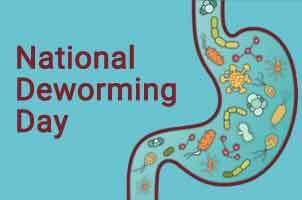 The National Deworming Day is a single fixed-day approached to treat intestinal worm infections in all children aged 1- 19 years, started in the year 2015 and is observed on 10th February and 10th August every year.